Baldur's Gate Website Lurches to Life, Is a New Game Rising? It's been eleven years since PC role-playing gamers claimed the throne of Bhaal, Lord of Murder, bringing BioWare's epic Baldur's Gate series to a satisfying close, but has the entire tale been told? New developments at the game's website suggest there's still life in the old death god yet. 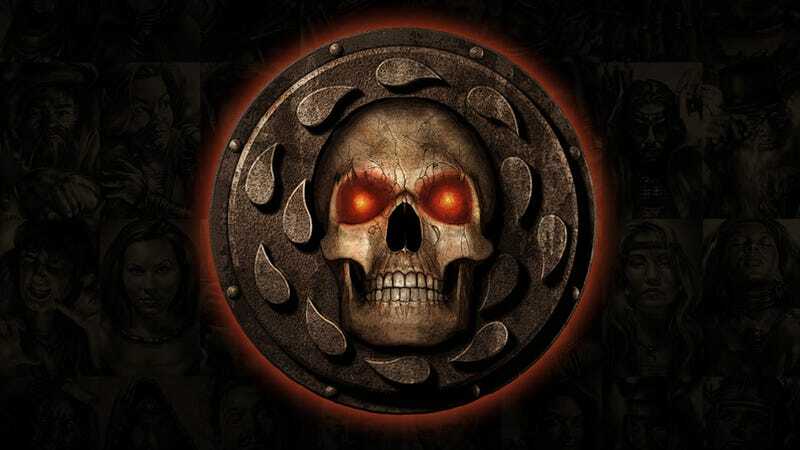 With the recent news that a Baldur's Gate II Complete Edition is on its way to Steam, one might conclude that the new logo and music at the Baldur's Gate website are tied into that particular project. That's what I initially thought, but then former BioWare designer Trent Oster, now of independent developer / digital PC game store Beamdog, put the kibosh on the connection via GameBanshee. "We're not related to the Steam complete edition, I can tell you that much. Other than that, we're hoping to announce something soon." The Infinity Engine is the BioWare-developed game engine that powered the Baldur's Gate series, as well as Icewind Dale I and II and my personal favorite, Planescape: Torment. "Raise Dead : Infinity Engine" would point towards a resurrection of this classic engine, but to what purpose? Oster seems keen to tease for now, but a recent Twitter post might hold another clue: "A new toy for the office. What could we be developing that would require an iMac?" You know what would play really well on an iPad? Baldur's Gate. I'm just saying. Being able to guide your party members by touch would be extremely convenient. And from there could Planescape for iOS be far behind? Of course this is just my guess. Other folks have different ideas, like a brand new game using the Dragon Age: Origins engine. I just don't see that happening. I see myself sitting in the bathroom shouting "Go for the eyes, Boo!" without a laptop burning my delicate thighs. And now you see that too. Sorry. Update: The code has changed, adding "Pore over the tapestries and works of art hanging from our walls if you wish, Child of Bhaal... perhaps you will find a clue. But patience, ah... patience would reveal it all."